Upsells are a great way to increase revenue on your online store. And the added ability to easily create funnels with customizations adds even more to the mix. It really is about the customer. One Click Upsells is simple. If a customer chooses to click “yes” on the upsell page, they don’t have to add their credit card info again. That is what makes it so slick. The One Click Upsells plugin for WooCommerce has been around for a few years and continues to improve with some very cool tools that add to its flexibility. Watch this video or read our post. I will go over these briefly, but they start with the option to combine upsells with parent orders. This simply allows the upsell product to be added to the initial order to save shipping costs, depending on who you use. Here you will set up the basics for your default offer page. You will be able to create as many custom pages as you want that will override a lot of these settings. When you first set this up, you can click to generate the default page. You will also note that the plugin integrates with the most popular payment gateways: Stripe, Authorize.net, Payflow Pro, Braintree and PayPal. We will name it so we can identify it later, but, as you can see, there are several ways to trigger your funnel, from single product to categories and tags. Even locations, dates, payment gateways, shipping rates and a lot more. The options for the customer triggers are cool—especially the one for new customers. It’s a great way to give a new customer a one-time deal or discount. Next you choose the products you want the funnel to apply to, whether you want to limit it to a specific number and setting a priority if it runs on a product that has other funnels connected to it. Your next step is to add the offers in the funnel. As you can see, this will be the first offer, and you can add as many offers as you choose to. You will also set some product options. Let’s take a close look at the options you have here. First off, you want to search for the product in the offer. Next you will select how you want to display it, whether on a custom page or the default page. We have two actions, depending on whether they buy the the product or not, as well as a Cancel target order. You will notice that in the action options, both offers and others are grayed out, only because I don’t have any set up. Once you have any set up, this alternative gives you a way is to send them to a few multiple upsells, one after another. As you can see here, the product options will show once you have added a product. Here is where you can offer your discount, set the quantity and choose from the shipping options you have set. In the price field, you can add either a percentage or a flat cost. There are some additional settings in the product option that are self-explanatory. For example, the ability to add a tracking code would come in very handy with specific needs, such as a Facebook pixel event. For this example, I have set it to apply to a single product. If ta customer purchases the Podcasters Digital Soundboard Pro software, the upsell will be 50% off the video series. Since this is the only upsell I want them to land on, I will direct them to the order received / thank you page. And I have toggled the skip this offer if product exist in parent order on. When I click on Place Order, I am taken to this page, where the special offer is. Remember, I used the default offer page on this one. Choosing to Buy Now, I am taken to a page that has the order completed. As you can see from this simple example, there are tons of ways you can create upsells. I hardly touched on all that you can do. As I mentioned before, you may want to add another offer in your funnel. I also need to go back into my first offer and and choose this second offer if someone does click the buy now button. As I noted before, I created a custom page for this one as I didn’t want the special offer as the title, plus I wanted to add a bit of content. This simple page was created with two shortcodes in the text links. Obviously, if you were to create a custom page, you may want to do something a bit more than the simple one I shared. The good news is that this plugin works with all the popular page builders: Elementor, Divi Builders, Thrive Architect, Beaver Builder and Visual Composer. When we go to checkout and place the order, we are offered our upsell for 50% off, as before. But if you choose to buy that, you will now land on the next offer for the free eBook. By accepting the free gift, the order is processed and the free eBook was added. You can see all your funnels here. This view gives you some basic info of the funnel and offers. It also gives you a nice quick view of the stats of the funnel as far a sales/conversions. You can disable or completely delete a funnel as well as duplicate one and reset the stats. A new One Click Upsells tab will also be added to your WooCommerce reports. And lastly, this plugin works with my favorite affiliate program plugin, AffiliateWP as well as two very powerful WooCommerce extensions: WooCommerce Subscriptions and WooCommerce Memberships. As I mentioned in this post, this plugin is very robust with a wide selection of triggers you can use when creating funnels, the versatility of designing landing pages for your upsells using one of the popular WordPress page builders and the its integration with payment gateways and WooCommerce extensions. You can learn more about the One Click Upsells plugin here. The post 13 WordPress Marketing Plugins to Help You Earn More 2019 appeared first on Colorlib. No matter what niche industry you are going to pitch yourself in, there is always something to promote. If you’re looking for a side project that can earn you some extra money, without a website you can’t compete effectively. One thing to do is to streamline the site-building process with one of affiliate marketing WordPress templates below. Without a doubt, there are affiliate opportunities for virtually any niche you can think of. Confused? Just look around. One thing is sure, affiliate marketing s still one of the most reliable ways of getting passive income. Start earning money by promoting other people’s products or services on your own website. Don’t sit and wait for inspiration to strike. It doesn’t work that way. Don’t be like so many affiliate marketers who have lost their way because of the skill gap. Planning and building websites with WordPress themes is an exciting adventure that shouldn’t be something that makes your brain hurt. For that reason, you need to grab the right solution that can minify as much the site-developing issues as possible. Give affiliate marketing WordPress templates below a check to ensure you can achieve the highest level possible with it. First, carve out a niche you’d love to succeed in then things will start to make sense. Let’s make some money! Are you in? Ambitious affiliate marketers look for the best solutions when it comes to creating a website. What makes Trendion one of the best affiliate marketing WordPress templates is it’s GDPR & Gutenberg ready. Achieve your goals by creating a website that never misses the aim. Apart from that, create new unique layouts to succeed in this growing industry. Besides, compatibility with Instagram Feed can be a huge help to bring in revenue. There’s hardly a secret that users crave engaging content, so make sure yours is stellar. The better your website can cut through the noise, the gladder is your bottom line, in fact. Wish to refer visitors to products and services that fit their needs? Do it right with Aldo. Clean, fresh and modern, Aldo is perfect for guest blog posts, rouge, viral blogs, affiliate marketing & personal portfolios. So, no matter what niche you want to pitch yourself in, keep peace in mind Aldo has you a lot to offer. What do you get with Aldo? First, a truly responsive layout that adjusts correctly to all modern devices. Second, being Gutenberg compatible, it comes with a massive amount of Gutenberg blocks & theme shortcodes to get creative with it. Finally, SEO optimized, it can keep your website’s rankings high no matter what. Gutentype is another specimen of affiliate marketing WordPress templates worth considering. Its clean & fresh layout fits all types of both personal & business websites. Indeed, it’s second to none for affiliate marketing websites as it’s WooCommerce ready, so it can mean a dramatic boost in sales. On top of that, you can choose from a wide range of pre-built layouts to get started with your website quicker. What type of skin do you prefer – a black or a white one? Skip a lot of the time-consuming work by making the best use of advanced customization options. At the end of the day, you’ll see that creating a site is not all that difficult. Once you decide to go for Avventure, you’ll be able to build a website without having to sweat for it. Designed to match the needs of modern travel websites, Avventure can give your website a leg up on the competition. The best thing about it is Elementor page builder that can numb your developing pain from day one. Apart from that, turn your hobby into a profitable business with tons of eCommerce options that come to your aid. Besides, you can encourage people to donate or join your organization. No matter how creative you want to get with your website, be sure a massive amount of custom shortcodes & widgets can help you achieve your goal. Creating an affiliate marketing website that serves as a personal blog will often mean that you are the ‘face’ of the business. Designed in a way that appeals to the user’s eye, Vagabonds sticks out a mile. Modern, attractive and responsive, it fits travel, entertainment and lifestyle blogs right off. Built with WPBakery page builder, it unlocks your creativity to make a compelling case with less coding issues. Indeed, it’s your chance to enhance your selling spree by starting selling products or services vis your website. One thing is certain, with Vagabonds it’s easier to attract the right audience. Not convinced? Give it a check. Do you want to the secret behind ShiftCV? There’s hardly a secret, it’s one of the best-selling affiliate marketing WordPress templates on the list. Designed in an easy on the eye style, it’s second to none to resume, portfolio websites and blogs. Want to pitch yourself in the photographer niche? No problem, its clean, fresh and a fully responsive layout is your greatest ally. Now, enjoy 7 beautiful homepage layouts to find the right one for your particular business needs. Take advantage of Elementor page builder to create something more personalized with less coding issues. At last, it’s WPML ready, so your website is open up to a new market. Looking for a worry-free solution that can make your life easier from the start? End your search here. Nobody likes hard stuff to do. But that doesn’t mean you can’t create a modern website like a pro. Bazinga is the universal solution that fits all types of both personal & business websites. Also, it features 3 beautiful homepage layouts to choose from as a huge help when getting started. The beauty of Bazinga is that it gives you the freedom to make any changes you need such as managing your custom post types or social media profiles. Make a smart investment that will pay you off in the long run. One of the fastest and easiest ways to make money online is by launching an affiliate marketing website. Buzz Stone offers you a quick and easy way to build a website and generate income online. Thus, designed to match the needs of modern personal & business websites, Buzz Stone is perfect for all types of blogs & affiliate marketing websites. It comes with 10 unique homepage layouts, so you have enough creativity to get started with. Sure, it’s WooCommerce ready, so it means a dramatic boost in sales. Experiment with the layout of your website to increase your income over time. Ready to give it a check? Melania is a modern specimen of affiliate marketing WordPress templates worth exploring. Clean, fresh and alluring, Melania fits handmade blogs and online shops. No matter what niche you are going to pitch yourself in, a big number of homepage layouts can help get you started. Besides, optimized for speed, your users will enjoy your fast loading pages and stay with you longer. Of course, starting your own blog is much easier with a diverse collection of blog post layouts. Increase the number of your subscribers with the help of a news subscription feature. What about selling products online? There’s nothing to stop you. What does it take to become an affiliate marketer? A modern WP template that minifies as much site-building pain as possible. Rosalinda stands out from the other affiliate marketing WordPress templates on the list. Compatible with WPBakery page builder, Rosalinda is flexible from the ground up. Go, create as many new unique layouts as you need. Forget about any coding issues and enhance the functionality of your site by making the best use of premium plugins. Try your hand at a huge set of custom shortcodes & widgets to make your website more interactive. Ready to start earning your first commissions? At the end of the day, you’ll see that’s not all that difficult. If you want to succeed as an affiliate marketer, Marcell is your safe bet. Multi-purpose, attractive & responsive, it works for blogs of any kinds. And guess what the best thing is? Indeed, Elementor page builder that allows you to skip a lot of the time-consuming developing work. Besides, integrated with AMP plugin, it helps your pages load almost immediately. As a result, your visitors are happier. Also, you get a set of beautiful homepage layouts that look amazing and work for any purpose. Want to enhance your selling spree? No problem, just make the best use of eCommerce options jam-packed in Marcell. If you’re serious about making money through affiliate marketing, Fashion Guide is the solution. Turn your hobby for fashion into a profitable business that can boost your income over time. Stylish, responsive & flexible, Fashion Guide can streamline the developing work. It fits all types of fashion, blogs & lifestyle magazine websites. With all the competition around, having the option to sell online is always a good thing. Responsive and SEO-friendly, your website attracts every user’s eye right off the bat. Besides, it’s cross-browser compatible and supports Instagram Feed & Booked Appointments. The better you get creative with your website, the better it can cut through the noise. Let’s give it a check. Your website is the one affiliate marketing channel that gives you complete control of your message and brand. S.King can be the worry-free solution that can save you a bundle. Designed especially for fashion websites, S.King fits also modern personal & lifestyle blogs right off. Built with WPBakery page builder, it allows you to create new layouts that are great out of the gate. Imagine, you can control the appearance of your website even with a skill gap. Besides, it’s compatible with the premium Events Calendar & Booked Appointments plugins. Since you can’t afford to alienate a good chunk of customers, S.King can help your website to be a cut above the rest. If you value high-quality products, Healthy Blog is the one that you can’t pass on. This stylish specimen of affiliate marketing WordPress templates sticks out a mile. Designed for healthy living blogs, it fits magazines & corporate websites. Since it comes with 4 beautiful homepage layouts, you can skip a lot of the time-consuming work. Don’t limit yourself & create extra layouts with WPBakery page builder. Thus, it’s easier to make sure your website looks more personalized. Display your contents in impressive & easy to customizable manner. Want to explore the power of Healthy Blog? The time is now. Once you decide to start a parenting blog, give Mamita a try. Clean, attractive and responsive, it fits pregnancy, maternity & gynecologists websites. Find a set of beautiful homepage layouts & a variety of pre-designed pages to choose from. No matter how skilled you are, spend less time coding. Instead, create new unique layouts by simply dragging and dropping elements. With the help of Slider Revolution & Swiper Slider, it’s easy to showcase your best offers in an eye-catching way. Indeed, starting a blog is a clever way to promote your affiliate products. Stay on top of the latest and greatest products within your topic to attract more readers to your site. Need more blog-worthy features? Make sure the more inside. As you learn how to start affiliate marketing, it’s a good idea to set up a modern website. Create branded social marketing business pages that can be a huge boost to your business. Besides, it’s much easier to sell affiliate products via the website that converts. Sure, responsive from the ground up, your website will more likely to appear on the top. Once your website is set up & running, it’s time to expand your horizons to new audiences through additional marketing channels. So, ready to unlock your opportunities? Make sure Femme is worth the trouble. Anyone can build a modern affiliate website with Melanie Hanson. Why? Because it costs you literally nothing to get started right now. Everything you need is right at your fingertips. Being one of the best affiliate marketing WordPress templates on the list, it has you a lot to offer. Integrated with the WooCommerce plugin, it can mean a dramatic boost in affiliate sales. Thanks to the powerful ThemeREX framework you can easily operate the theme with less coding issues. At last, tons of custom shortcodes & widgets can help showcase your skills & achievements, missions & priorities, and the like. So, how would you like to take this forward? Spiced Blog is second to none solution when it comes to blogging. Colorful, attractive and easy to customize, Spiced Blog can help make your affiliate marketing business grow. The thing is that it comes with WPBakery page builder so the process of creating new layouts is not rocket science at all. Imagine, you don’t need to bother with any coding. Apart from that, you can choose between a variety of blog post layouts – right/left sidebar, full-width or boxed version. You can start by choosing how you wanna play the game. Lead your customers through a buttery smooth online experience to help you scale like a pro. Why is affiliate marketing the best thing for you? Simply because you’re your own boss. To start generating passive income it’s crucial to build a modern website even with a skill gap. Fear not, it’s easy to create your own brand that can effectively compete against the crowd. Gracioza is a fresh specimen of affiliate marketing WordPress templates you shouldn’t pass out. It suits all kinds of sportsmen & healthy lifestyle websites right off the bat. On top of that, it comes with an awesome height/weight calculator, tons of pre-made pages and a variety of advanced contact forms. At last, a massive amount of eCommerce options can make a huge difference in your success. Crypton is a top-notch solution that fits both cryptocurrency & financial websites right off. If you consider yourself a cryptocurrency expert, let the world know about it. Consumers crave engaging content and not only if it’s about bells & whistles, but also don’t be afraid to include any ‘cons’. Enjoy a huge set of pre-designed pages to create a website that converts leads. Indeed, you can easily start your own cryptocurrency shop & encourage your users to donate or join your brand. To help your users get up to speed, offer them to use a multi-currency calculator or learn the top news from the pages of your website. Make a smart step to move your affiliate marketing business forward each day. Are you thinking of becoming an affiliate marketer? Confused about the right solution for your website to get started with? You definitely can’t go wrong with Health Coach. Being one of the best affiliate marketing WordPress templates that stand out from the rest, Health Couch is the right spot to get everything you need for less. The best thing is that WooCommerce ready, it allows you to easily add the online store functionality to your website. As a result, promoting and selling affiliate products or services becomes a smooth track. Besides, you don’t need to learn how to code because the power of WPBakery page builder allows you to skip all that developing troubles. Take a look at Street Style. Clean, stylish & attractive, it can help present your affiliate marketing business in a more appealing way. Indeed, jam-packed with 10 beautiful blog post layouts, it allows you to promote your affiliate products in a more clever way. Designed for fashion & lifestyle websites, Street Style can be used for any other type of personal or business web project. Enjoy exciting site-building adventure that leaves all the technical complications behind. On top of that, it’s compatible with Instagram Feed, MailChimp and WPBakery page builder. No matter what niche you’re going to pitch yourself in, Street Style can be your safe bet. Once you get a clear picture of what’s right for you, try your hand at GlamChic. Create a website right at the beginning of your affiliate journey is key to a successful affiliate marketing business. Designed in an easy on the eye format, it fits all websites related to the fashion, cosmetics or beauty industries. To begin with, you get a set of 3 beautiful homepage layouts which are your greatest ally when getting started. Thanks to the WooCommerce integration it’s easy to get ahead of the competition and make your money keep coming in. Thus, you can easily edit, manage and tweak the overall look of your website even with a skill gap. In fact, nothing wrong with that at all. Whether you want to promote wedding photographer services or build an online store selling photo equipment, July Morison is the solution. Built with WPBakery page builder, it can help minify as many site-developing issues as possible. So, you can easily create new unique layouts and spend less time learning how to code. With WooCommerce plugin, you’re getting the benefit of selling affiliate products or services straight off. Want to manage your bookings online? No problem, Booked Appointments plugin can be a huge help. Now, it’s time to create compelling content that draws users in for a good reason. Whatever your goal, find a win-win solution that works for you. Daniel Green is another great specimen of affiliate marketing WordPress templates worth exploring. Built especially for writers & journalists, it fits all types of blogs both personal & business. With the initial purpose to earn extra income, compelling content is the key to win. Besides, you can easily control the appearance of your site even with minimal skills. You’ll love it for everything that it offers you right off the bat. This is hardly a secret that the responsive website is more likely to appear on top of search results. Now, it’s time to make money from a website that attracts more traffic and improves your brand exposure. Once you decide to go for Niobe, expect to have a website that makes money. Modern, attractive & responsive, it fits all kinds of sports websites & healthy lifestyle blogs. Don’t let your skill gap dismaying you. There’s no need to bother with any code since Niobe allows to control the appearance of your site like that. Apart from a set of pre-made pages, Niobe comes with a range o contact forms, weight/height calculator, and events management. On top of that, it works with WooCommerce, so selling online becomes a smooth track. To get an idea of why Niobe is the cream of the crop, check its live demo. You’ll be surprised by what it offers. Based on Gutenberg page builder, Especio is a pot of gold for healthy food websites. Indeed, being one of the most alluring affiliate marketing WordPress templates, Especio allows you to get creative with it. So, you can control the appearance of your website to match your particular business needs. And guess what the best part is? Sure, the ability to create the blocks directly from the text editor mode. Try your hand at Gutenberg blocks to enjoy its ease of use while on the go. At this point, you can add an online store functionality to start making money from fact. So, what does it take to become a successful affiliate marketer? Well, Especio and a little creativity. It doesn’t matter if you promote the best product possible in your niche, without a website no one knows you exist. So, if you want to spread the word of mouth for affiliate products, you’ve won a jackpot – Hobo is a big win. Built with Elementor page builder, it gives you the freedom to experiment with the overall look of your site for less. Indeed, you want your website to jump the queue ahead of the tough competition around. Let WooCommerce integration help you achieve your goals. Hobo has everything you may need to bring your affiliate marketing business up a notch. One thing to do now is to give Hobo a try. If you want to get started with affiliate marketing, Katelyn can be a huge help. It’s in your own interest to promote products and services that will be of interest to your website’s visitors. So, make sure your website is the first spot where your visitors go to make purchases. Thus, based on Gutenberg page builder, Katelyn is one of the best affiliate marketing WordPress themes on the list. It offers you a world of opportunities to get started quicker. Indeed, SEO-friendly and responsive, your website has a better chance to jump ahead of the crowd. So, would you like to take advantage of Katelyn right away? Affiliate marketing can seem challenging at first. Yet, with one of the best affiliate marketing WordPress templates, it’s easier to maximize the selling potential. It’s clear that your website needs to stay up to date in this fast-changing world. With Maxify, you can be sure, your website is built in line with the latest web design standards from fact. Designed for business blogs & startup websites, Maxify comes with Elementor page builder that takes your developing pain go away. Poke around its wide variety of customization options, beautiful pre-designed pages & powerful theme settings. So, are you ready to make a big impression on your visitors? At least, you can try. Would it be nice to get extra passive income for less? Indeed, especially when the variety of affiliate marketing WordPress templates abounds. No matter what product or service you are going to promote, spark attention with a website that can boost your sales opportunities. It may seem intimidating at first, especially if you have no experience at all. No worries, though, the technical complications are not a concern for you. Once your website is up and running, you can expect to make profits. So, what are you going to choose? To start fast, or to fail fast? You will achieve even greater results with your advertising agency when you construct a website using one of the best marketing website templates. Just like your work should be of the utmost quality, so must be your web presence. If you are a marketing agency that helps other companies grow beyond expectations, your should appear professional across all sectors of your business. With a powerful website, you can expect new business deals to happen regularly. Promote your services using the valuable features and carefully put together sections. Add testimonials to build customer trust and showcase your completed project with a gorgeous portfolio. On the side, you can even start writing a blog and get potential clients persuaded with a look behind the scenes. Not only that, you can use the blog for content marketing and grow your agency or freelance business organically. Contemporary web design, innovative features, great UX and easy to manage and maintain, that’s what you get with our marketing website templates. You can start using the advertising website template right off the bat and have the website ready swiftly. Weber is a serious competitor when it comes to the best marketing website templates. Although it is a multi-purpose tool, it still takes things to the entirely new degree with what it has to offer. One of the best and handiest features amongst the vast number of them is definitely page builder. While you get a ton of predesigned content in the Weber kit, you can still hammer out your own layouts quickly and effectively. And it asks for very little knowledge regarding site development and design. With the included 33 pre-built pages, 410 unique and attractive sections and countless other valuable assets, Weber provides unlimited options for building the right page for your marketing business. Speaking of marketing, Weber also comes integrated and compatible with all the major marketing tools, like MailChimp, GetResponse and similar. Do your thing and do it big with Weber. Margin is best recommended for any SEO, marketing agency and startup website. It is a clean, solid and versatile, as well as easy to customize and optimized for top-notch performance. For a small investment, Margin delivers a lot of features and assets that you can utilize to push your marketing services to the next level and attract loads more potential clients. Gosearch is a social media and SEO marketing related website template with loads of goodies at your disposal. You would definitely want to check this one out and see how much you can accomplish with it. Along with creating the necessary web space, you can also grow your business to an entirely new level, grow your clientele and see the success you always wanted to witness. With four different home styles (read headers) and all the other internal page, Gosearch provides more than enough for a fully functional page. Other traits of Gosearch are Revolution Slider, responsive and retina ready layout, social media links and cross-browser compatibility. We are not done yet. The web design of Gosearch is modern and clean, ideal for serving all your modern mobile users and letting them have the experience of a lifetime. As a beginner in the web space, you do not mind taking shortcuts while simultaneously save money. This is when predesinged website templates come into the picture. With little prior experience, you can still make your dream website with relative ease. Digency is a trendy marketing website template for digital agencies’ online appearances. Do speed up the site establishment time with a ready-to-use tool and start promoting yourself as quickly as possible. It is responsive, offers a smooth parallax effect and a highly customizable website canvas with a minimal web design. Free yourself from the technical aspect of web development and get things going with Digency. It has all the useful pages, starting with an enticing home design. Digency is built with valid HTML files and powered by Bootstrap 3. Unique look and fantastic functionality of Digency will spark their interest to learn more about you and potentially ask for a quote. Bulkit is a kit of features and assets that are ready for you to utilize and hammer out the page that will help you scale your agency. It is a marketing website template based on the Bootstrap alternative, Bulma. Another powerful framework that will ensure you site stability and flexibility. Bulkit was also put together in a way friendly to beginners. All this tells you is the that the scheme is simple and straightforward to modify and tailor to your needs. With as big package of stuff as Bulkit is, you do not have to worry about building anything yourself. There are different smaller predesigned packages of niche demos within, as well as exclusive agency, startup and dashboard layouts for your convenience. On top of that, Bulkit provides many reusable components, awe-inspiring illustrations and other whatnots to customize web design however you fancy. For SEO and other digital agency, Venezia is a marketing website template with cleanness and professionalism. However, it is fun enough to get things done differently compared to how others do it in regards to their online presence. Venezia is a modern and trendy tool with two home styles and two different headers. Besides, Venezia also has all the inner pages for you to cover your entire firm. From about and services to projects, blog and contact pages, all these are ready and set for you to utilize. Smooth parallax effect, Slider Revolution, pixel perfect design and effortless to adjust, these are just a few of the assets you unlock yourself with Venezia. It is also fully mobile-ready, responsive, compatible with web browsers and optimized for search engines and speed. The experience will be the same amazing one regardless of the device and platform used. No matter how many ideas you might have for various online projects, Quadra is the creative and multi-purpose website template that will help you realize them. It is a super powerful tool with over seventy demos, more than 110 shortcodes and a whopping 130 portfolio layouts. The list of ready-to-use material does not actually stop here but I just do not want to overwhelm you. Okay, I will give you another one. To create a strong first impression, Quadra predesigned 150 slider examples for you to find the right one out of the box. Amazing speed capabilities, Slider Revolution, Bootstrap based, parallax effects, you name it, Quadra does not leave anything out. But if there is something missing, you better need to think twice about whether or not you truly need it since it is probably irrelevant. Quadra carefully thought of it all so trust the web design, it is all there, a click away. Although SEO Tropica might be an ideal solution for your search engine marketing agency, you do not need to feel limited. This marketing website template is versatile enough for you to apply it to other types of digital agencies easily. Even when it comes to the default web design of SEO Tropica, you can either use it as is or you can enhance it however you see it fit best. One thing is for sure, it is definitely not going to be hard doing any modifications. SEO Tropica comes with over 26 responsive and mobile-ready pages. With all the pre-set material, you can already have a complete solution for your SEO agency. Choose from five color schemes, utilize Slider Revolution and pick the right premium icons and stand out from the crowd. Of course, SEO Tropica is also retina ready and supports all the major web browsers. SeoBin is another marketing website template that will serve SEO firms best. Still, the tool will comfortably work with other digital and marketing agencies that are in heavy need of a neat and tidy web space. SeoBin is here to do its thing and take care of your online presence. Not only that, the tool makes sure you have it all set and ready to go live in as short time as possible. Kind of cool, don’t you think? Eight index pages and additional fourteen internal sections, a variety of headers and even free PSD files, the list of goodies this tool offers you is large. SeoBin is also powered by Bootstrap to give you the flexibility that your outcome needs. Last but not least, great and friendly coding is uncomplicated to edit and adjust it to your needs. The cryptocurrency industry is immense and there are many who are in need of assistance and support to get their thing in order. This is where you come into the picture. Digital Coin is a marketing website template that is exclusive to the coin market. With its four predefined front demos and many internal pages, Digital Coin gives you a chance to bring your project online in a breeze. On top of that, it makes it accessible so everyone can do it struggle-free. Since being entirely mobile friendly, Digital Coin also has a mobile ready menu for comfortable navigation across your site. What’s more, there are PHP contact, subscription and quotation forms, catchy footer reveal feature and numerous other assets available for you to make use of. Digital Coin also follows all the modern web and tech regulations for you to be confident that your site will be stable and function well all the time. Casely is a creative, contemporary and unique marketing website template to get your brand out there. But truly, whatever service you offer and no matter what is the initial reason you need to build an online portfolio for, Casely is here to help. It is ready for almost any challenge, allows you to modify it and make changes to resonate you and your services best. With the available content, you are able to do your own thing with ease, without the need to get too technical about it. Beautiful samples are at your disposal for a quick start of your refreshing and novel website. Casely is well-documented, shipshape, responsive and retina display ready. In other words, doing any refinements to it will be fun and exciting while the outcome will deliver the same banging experience to all levels of your users. Another behemoth amongst multi-purpose website templates. Here is WrapKit. Seriously, this tool is a giant. With the amount of content it comes with, you will find numerous different solutions how to execute your web space in the best possible way. With its diversity, WrapKit is also a marketing website template with all the required to get your word out there and start grabbing the attention of potential clients. Just pick the demo and start from there. WrapKit is a Bootstrap built template with a modern and beautiful web design that will appear in the same fashion regardless of the device they use to browse the web. The website canvas reshapes the design instantly for a top-notch experience. Twenty headers and footers, forty banners, slider and forms, different pricing tables, testimonials and enticing call-to-actions, make sure you further investigate WrapKit. Take action and wrap it up in a few. Do you do website audits, link building, content marketing or general consultancy? If so, you might want to look into SeoPlanner marketing website template. It is a features and assets packed template using all the latest technologies for an always seamless running. Despite the device and browser they use, SeoPlanner resizes your website accordingly, still displaying all its content beautifully and wonderfully. SeoPlanner will boost your marketing agency or even your freelancing business to new heights. SeoPlanner has a one-page layout and comes in three different styles. Additionally, it has two extra pages for about and services in case of need. However, the single-page layout has more than enough space to cover your entire business including services, pricing tables and newsletter subscription form. The neat and professional design will surely spark their curiosity and make them hungry for more. If you are working on a bunch of different projects, a cutting-edge multi-functional website template will come handy. With a tool like Pofo, you can do loads of mixed things when it comes to building pages for different niches. It is also safe to call Pofo a marketing website template because it has all the features and assets to craft such web space quickly. You will certainly find a demo that will suit your needs. From then on, alter it and make it follow your branding to the T.
25 ready-made homes await every Pofo users. Unbox the mad package of goodies and start bringing into being the required website and scale your marketing project to the Moon. Fantastic portfolio styles, Slider Revolution, over 150 one-of-a-kind elements and clean headers and menus, yes, all this and a whole bunch more is what you get with Pofo. No matter what type of marketing you specialize in, Corporate is the business website template that you need. Bring your services online and start taking your project to an entirely new degree. The content is there, you just need to unbox the Corporate package and start putting the stuff that you find inside to use. You will discover three different home styles, numerous internal pages, Revolution Slider and a functional contact form with Google Maps. Corporate is an up-to-the-minute template with a minimal, contemporary and expert-looking design. It is 100% responsive, retina ready, optimized for killer performance and search engines. If you are ready to finally get things done, do it fast and efficiently with Corporate. It is nothing missing in the bundle so there is no need for you to build anything yourself. Avoid the effort and time and have the page up and running swiftly. Faulkner will get your marketing agency set up with a fresh or redesigned website with little to no effort involved. Potentially, you will also need to spend barely any time on coming up with the exact design you fancy. Plus, the features your service requires to be presented in the best light are already available. To sum it up, with Faulkner template, you only need to have the basic coding knowledge to edit what is predefined. However, even if you are new to site development, folks behind the template are happy to help. To get yourself or your client sorted out with a new website, Faulkner’s features come exceptionally handy. The product comes with over 150 pre-built content blocks, twelve home pages, stunning footers and headers and all other necessities. To capture visitors’ emails, Faulkner has a functional MailChimp subscription form. MiniPo is a minimal portfolio website template for marketers, digital agencies and everyone else who needs a clean and elegant web presence. You will make it happen swiftly with MiniPo template. If that is something you are after, it only took you this little time to find the ideal item. Is that luck? Or did we know exactly what templates to put in the collection of the best marketing website templates? You be the judge. For the quickest website launch, benefit from MiniPo’s many remarkable features. Eight homes, twenty-five portfolio and twelve blog pages but a total of 52 HTML pages is what you are treated to. MiniPo is mobile-friendly, cross-browser compatible, ready to take any redefining challenge and optimized for search engines. Promote your marketing services to a wider audience and grow accordingly. To display your projects and services online and make visitors intrigued by your offersings, a solid website is a must. Create one with any of the marketing website templates and boost your advertising agency to new heights. Camel is a professional website template that enhances your expertness and absorbs everyone visiting it. Of course, it is your skills and talent what matters most but a compelling web design is crucial, too. Every area of your business needs to be first-rate in order to see the best results and achieve the set goals. The modern design of Camel template along with parallax sections, Slider Revolution and animated stats and skillbar grab everyone’s attention easily. Filterable portfolio, modifiable Google Maps, advanced typography options and search engine optimized, Camel follows all the latest practices. Your site’s performance and UX will be the best. Cynic is an exclusive marketing website template for digital agencies offering SEO, PPC and other advertising services. It is powerful enough to suit small, medium and big agencies, as well as one-man-bands. There is a lot you can do with Cynic and turn it into a standout website for your phenomenal talent and skills. Spark interest in guests with one of many available classic and modern demo layouts. Select the one that you find of the best fit and start improving it. Or simply add your content, info, logo and other details and have a page finished in a snap. Let’s break down the available templates Cynic delivers. One has a total of 42 pages and is best for big agencies. The second one is for small-to-medium sized digital agencies with eighteen pages and the last one is for one-page websites. SEOhub marketing website template helps your business to get online with a bang. SEO, social media, general marketing and advertising, no matter what you excel at, SEOhub covers the major part of your website building. You only need to do a few simple tasks and you are pretty much ready to hit the online streets. But what exactly do you get with the SEOhub package? Five differing home styles, over fifty inner pages, several header and navigation variations and a thorough documentation. The other key features of SEOhub HTML5 template are Revolution Slider, responsive mega menu, retina display ready and parallax effect. Of course, there are many more but we might talk about the rest some other time. Rush checking live preview and see SEOhub real-time, all its demos and other components. By using a solid Bootstrap business website template for an advertising agency, your online presence will be of the highest standards. Gullu.ly is the template you can create terrific websites with. Wait until you see it live and check all its amazing features, extensions and elements. But first, you need to select one of the predefined demos. Those are three and vary from creative agency, corporate and business. Of course, you can use all three for advertising businesses of any type. Gullu.ly has pixel perfect coding, responsive and retina friendly design. It is compatible with modern browsers and rocks the latest Bootstrap Framework. Besides, you do not have to be an expert to feel comfortable refining Gullu.ly’s layouts. On top of that, reliable customer support is at your service at all times. Do we hear an infinite amount of options that infinity template delivers? If one-page website template is what you are looking for your marketing site, then the answer is affirmative. So far, there are twelve demos at your disposal but more will drop with future template updates. Speaking of updates, those are free for every user. In addition, infinity also has twelve headers and twelve footers for you to come up with the needed combination easily. infinity satisfies everyone who is after a template with a parallax effect. That is something infinite marketing website template is exceptionally good at. What it is also great at is SEO, cross-browser customization and responsiveness. When it comes to modifying the color and editing other elements of infinity template, do it at free will. If there is one website template that does not need multiple front page styles it is none other than C-Biz. In C-Biz’s case, one is more than enough. It is all because this one is hefty enough to suit a multitude of users. What is more, C-Biz does not have a single issue satisfying even the pickiest business owners. As a matter of fact, that is what C-Biz is extremely good at. C-Biz is a multi-page website template with a clean and validated HTML5 and CSS3 code. It is organized in a friendly way so even beginners can fully benefit from C-Biz template. Expect your website to have CSS3 animations, fancybox photo gallery, video that opens in a pop-up and a portfolio no one will be able to resist. Today, any businessman knows that they need to run a worthy website in order to develop their company. Actually, in 2019, managing a stylish and customer-friendly website is a wise way to get your audience. To say more, it’s a real must-have for any beginner. As a result, the number of new-born business sites increases every day. With it, affiliate marketing became a popular thing. Are there any themes for it? Obviously, there are lots of products you may find to run a website related to a digital marketing agency. However, which of these products is really worthy of your attention? To help you with the final decision-making, in this post, I’m about to review another popular WP theme – Laraway. Jonah Sachs once said that “good marketers see consumers as complete human beings with all the dimensions real people have.” Looks like it’s time for you to do the same! You know there are many WordPress themes for affiliate marketing but why Laraway? What will you get choosing this item? Let’s see! Who May Be Interested In This Theme? To make a long story short, Laraway is extremely easy to use. Originally, Laraway was made for digital marketing and consulting agencies. In fact, if you want to set up a voguish website, here is your ready-made solution! Thanks to such things as a simple interface and creator-friendly admin panel, Laraway can be used by users of any skill levels. It means that you won’t need any website building experience, coding knowledge, or something like this. Working with Laraway, you can launch the needed website without editing or writing a single line of code. By the way, this theme will cost you $75 only. How To Create A Website With Laraway? So, how can you run a site without touching its code? Here is the most popular question asked by beginners. To start with, the days when managing a cool site meant big money are far behind our backs. In 2019, it’s possible to make your best in website building even if you have never owned an online project before. What’s the secret? Officially, this secret is called drag and drop technique. Nowadays, this is the most comfortable way you can create, manage, or update a website. As the name of the technique says, all you will need to do is to drag UI component and drop it to the editor window. I know it may sound too good to be true but drag and drop editing is super easy in use. Where will you get these UI elements? Let’s back to Laraway to see the answer. Another nice thing about Laraway is that you also get a brand-new Live Customizer. It provides you with multiple options to optimize the site. Furthermore, you will be able to preview all the changes. Thus, making a mistake will be almost impossible. To sum everything up, thanks to Power Page Builder and Live Customizer adjusting the design of your site will be as simple as it gets. By tradition, buying this premium WP theme, you get multiple layout options. It means that you will be able to choose from a large set of options and experiment with the structure of the pages. Besides, you can speed up your working process and make it even easier. There is a built-in library where you can save your fav layouts. Just use them as soon as you want to create a new page. In a word, SEO is a must-have for anyone who wants to run their website. In fact, Search Engines Optimization is a smart mechanism that will help your site to be noticed by Google and other search engines. Knowing about modern SEO demands, you can stand out from the crowd and get more attention. How does it work? Well, as soon as your site will be noticed, the engines will scan it. In case the site’s code in SEO-friendly, you’ll get a higher search result. Needless to say, being in Google top search results in the dream of any startup owner. There’s one more thing you should know about SEO: you can’t buy the results. Everything is pretty fair! Thus, start making your site SEO-ready right now. Same to all the named options, Search Engines Optimization comes will all the modern WordPress themes and Laraway is not an exception. Choosing this product for your website, you have 100% SEO-friendly web design which meets all today’s requirements. Among the features of Laraway, you will see numerous plugins. Here are just to name a few. To start with, you get Cherry Theme Members. In case you are going to manage a professional and reliable website, this is a must-have plugin for you. Using Cherry Theme Members, you can introduce the members of your team in all their glory. Just share the details about your team’s bio and showcase their experience to prospects. Secondly, you will get the Cherry Projects plugin. This is another important asset you should use to catch a customer’s attention. Using the plugin, you will showcase your best projects. To do it, you have a lot of filters and a large variety of layouts to choose from. Cherry Search plugin is the very thing to improve the usability of your website. The plugin is intuitive and simple. Basically, the main task of any website owner is to let their visitors find what they exactly looking for. That why you need Cherry Search. It is seamlessly compatible with WooCommerce, so you can use the plugin for your shop. All in all, Cherry Search is perfect for any kind of website. Next, you get Cherry Sidebars plugin. With it, you can create a different custom sidebar and add them easily. Without a doubt, the structure of your online project matters and it matters a lot. That’s why I recommend you to try this plugin. Using Cherry Sidebars, you can organize your business site in a professional way. Finally, you get Cherry Testimonials. This is a trendy WP plugin you can use to design beautiful testimonials with the feedback from your customers. Here is the most important part of any web design – its navigation. Why is it so vital? Well, to start with, navigation if one of the first things a prospect sees about your project. And it is definitely the first thing a visitor works with. To make your website a modern go-to place, you need to make it extremely customer-friendly. Here is what you get with Laraway WordPress theme. There is a 100% responsive design which looks amazing on any device. It does not matter which screen size a customer prefers or which browser they use. With the help of Laraway, your online project will always look brilliant. Secondly, your website will be integrated with all popular social media. They say content is fire, social media is gasoline. There will be small SM icons you can put in the header or footer. Don’t hesitate to add your links to Instagram, Twitter, Facebook, and other social media. This step will bring your more social traffic and will show the prospects that you are a real person with real social media accounts. Next, you get an intuitive search that is located right on the top of your site. Your visitor will notice the search field as soon as they enter the site, so people will never be lost. There is a place for your colorful banners to introduce your best deals or top-rated projects. In addition, you can place there a couple of CTA buttons that is still the best way to talk to the audience. Needless to say, Laraway provides its owner with numerous content elements. Among them, you will see interactive counters. Use this feature to present important information. In fact, the human brain is a weird and complicated mechanism. It recognizes visual elements faster than other types of information. That’s why counters are your must-have. To say more, our brain remembers visual info for a longer period of time. Without a doubt, we should not forget about your blog. You will need this feature even if you are not a blog person. All in all, a blog is an old and proven way to keep the connection with your clients. What’s more, that’s how you can keep people engaged! Thus, you should run a blog and update it on the regular bases. You will find all the needed tools in the pack of Laraway. Besides, talking about your site navigation, you can showcase the newest or the most popular posts from your blog right on the main page! There’s Featured Projects option that is meant to highlight your most impressing works. On top of the website, you will see the Newsletter Subscription form. Obviously, choosing this WP theme, you have many ready-made pages, content modules, and custom widgets. As you can see, this product contains so many in-style options for you. The list can be endless. Thus, I recommend you to open the demo of Laraway and check out the way all its elements work IRL. Making money online with affiliate marketing is one of the easiest ways to improve your earnings. These days, affiliate marketing has become a trend for almost all internet marketers. As an affiliate marketer, you can promote by linking to associating services or products. Then you earn an affiliate commission for each sale or lead you generate. To make this happen, first of all, you need to have a well-crafted website design to engage your visitors. This is why we recommend using one of the best affiliate marketing WordPress themes. Better design increases conversions, so the same should be true with affiliate themes, right? In the marketplace, I have seen that there are so many quality themes that take affiliate marketing as a secondary priority. It can be difficult to showcase affiliate products if your theme isn’t designed for affiliate marketing. Keeping the fact in mind, in this article, I am going to share 10+ of the best affiliate marketing WordPress themes (in my opinion) to skyrocket your success. There are a decent number of quality themes that are developed and designed solely for affiliate marketing. Hopefully this article may help you to choose a quality affiliate theme by eliminating any confusion regarding the matter. The themes I have mentioned here are all top-notch and maintain diversity that can facilitate requirements of different niches. So let’s get started! 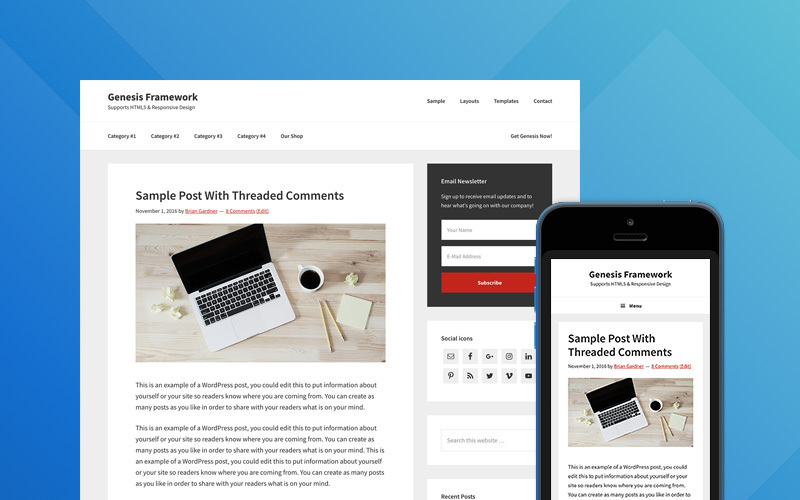 Genesis framework developed by StudioPress is one of the most popular “themes” in the marketplace. It’s really a WordPress framework, rather than a theme. This is an intuitive and most accessible WordPress theme that enables you to transform from novice to expert. Using this theme you can create a professional website effortlessly for running your affiliate marketing within the shortest possible time. With plenty of theme options, in Genesis, you get the freedom of handling any component of your site from one column to three columns content layouts. Moreover, you can get a sober, elegant color scheme, in-built SEO tools, fully customizable sidebar, customizable menus, ambidextrous sidebars. You will even have the search engine indexing techniques to boost your site ranking in the search result. This is a coupon based theme for the affiliate marketers and bloggers. The theme is specially built for the daily deals and coupon websites. Kupon contains a user-friendly interface that facilitates its user to operate the theme easily. You don’t need to install any third-party plugin while using this theme. Moreover, it’s in-depth customization facility offers an easy, fast, and no-frills experience. Kupon can be used by the affiliate marketers for its generous number of features. You can easily customize headers, footers, sidebars. You can integrate the theme with multiple platforms. For instance, you can integrate the theme with WooCommerce and WC vendors. Apart from this, if an affiliate marketer needs a solid framework to demonstrate multiple and varied catalogs for all the affiliate partners, Kupon could be the best option. The theme includes WooCommerce PDF vouchers integration with a dynamic search and filter opportunity. Simpli Pro is a premium WooCommerce and Blogging theme for the female entrepreneurs. Though the theme was designed and built with a feminine touch, it can be used for just about any website. Just tweak the colors and fonts. You also use the theme for blogging and E-commerce website. As an affiliate marketer, you can create blog sites for promoting the products, or you also can create WooCommerce to sell others products on your site. One of the most important aspects of using Simpli Pro is its versatile usage in all the areas. The theme can use Women entrepreneur, bloggers, health coach, politicians, and even motivational speakers. There are a plethora of features and functionalities of this theme. Its handy customizing facility makes things more user-friendly. The most important aspect of this theme is its in-built integration of King Composer page builder and WP Fluent Form plugin that allows every user the control over the entire website without writing a minimal code. Most of your target audience might be going to visit your site thinking your site would look the same in all the devices, and Simpli Pro theme makes this happen for you by making your site mobile friendly. Total is a smart, pliable, and responsive premium multipurpose theme. The theme allows its webmaster an easy going website building experience with easy to use interface. The theme is the best suited for a wide variety of websites and purposes. As an example, you can use the theme for corporate blogs, business websites, professional portfolio, and commercial online stores. Using Total, you can integrate WooCommerce with your site that allows you to create any marketplace-based website where you can start an online business, and sell almost everything on it. Apart from the WooCommerce integration, the theme offers a built-in revolution slider plugin for slideshows. Moreover, Total provides its users with dozens of elements, shortcodes, and a bunch of features. There are 40 different elements animations with the theme that makes it more interactive. You also get multiple pagination options and multiple header options. MagPlus is a modern, dynamic, and GDPR compliant magazine WordPress theme. The theme is developed by an elite web developer team named “Theme Bubble”. It’s said that before creating the theme, they spent more than one and half years on understanding the market, and other relevant issues about the theme. MagPlus comes with more than 40 inbuilt custom templates for its users. Using MagPlus Theme you can create any kind of website regardless of any kind of niche you have chosen. For an affiliate marketer, this could be a great option to work with the theme. Thinking about the user perspective, the theme offers its users 25+ custom layouts. There are dozens of custom styles that you can use for the content. 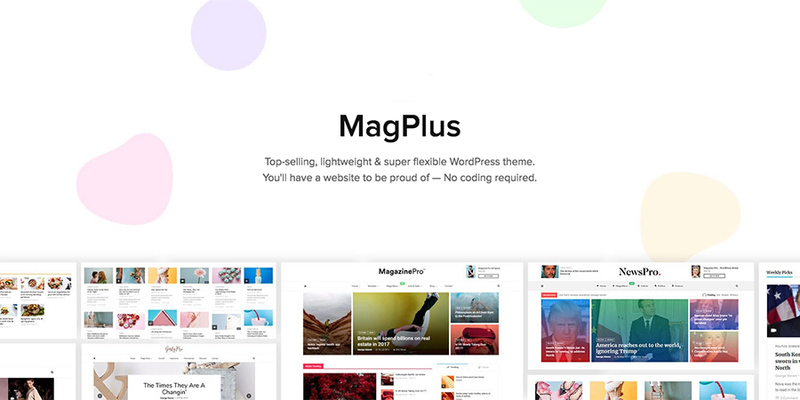 Moreover, MagPlus also comes with 20+ exclusively built custom widgets to take your website to the next level. Marketing Pro is a smart WordPress theme for affiliate marketing, digital marketing, and online selling business. This theme provides 7 built-in demos with outstanding advanced features. It also presents 9 pre-built templates with one click import facility. All you can get without knowing any coding knowledge. Use different demo version as you find from the official installation. Moreover, the theme uses Visual Composer as a page builder. Plus it includes the popular Slider Revolution plugin to boot. Additionally, the theme supports WPML for translation and Google fonts styles for typography. Moreover, stores and every money-related exchange are made through WooCommerce module. Using the diverse design of the theme, you will get the opportunity to play with six distinct headers, boundless of sidebars, and 30+ inner pages. Marketing Pro is incredible for affiliate marketers who are keen on beginning with different niches. Ultra is one of the top popular multipurpose themes in the ground created by Themify. This theme comes up with 60 pre-designed layouts. This awesome theme provides you with a built-in drag & drop page builder. With the dozens of built-in designs, layouts, and templates, you can make your website more dynamic in type. For affiliate marketers who want to start a blog, this theme could be the best option for them. Using Ultra, you will get a whole lot of awesome features like parallax scrolling, animations, counters, Slider, Google maps, and many more. It allows you to customize your website in various ways. You can change the logo, colors, background etc from an easy to use options panel. The built-in page builder also allows you to create beautiful page layouts whenever you require. Rehub is a premium theme packed with numerous features for affiliate marketing businesses. There are a lot of options available in Rehub like related product display feature, adding reviews, comparisons, product showcasing and many more to your website. If you are affiliating other products or you are selling your own products, this could be the best options for you. Uploading this awesome theme you can have the full support of two leading powerful plugins named WooCommerce and Easy Digital Downloads. You also get some in-built affiliate plugins, one is for creating comparison tables, and another is for managing your outbound affiliate links. The functionality of the second plugin is to track the clicks your links receive and everything you can handle from the one dashboard. The customization facility of the theme is awesome as you will get much flexibility in configuring the theme in different formats. It comprises different layout systems, an online store format, or a magazine layout format. In a word, using this theme you will get a full-fledged modern design with lots of affiliate related features. SteadyIncome has been designed and built especially for WordPress affiliate programs. The theme is the product of MyThemeShop team that shows that it would be an excellent product around. One of the most important aspects of the theme is its fast loading performance that ultimately results in higher conversion rates and improved ranking in the search engines. Moreover, using SteadyIncome, you will get a set of features that will facilitate you to earn money online through affiliate programs. For instance, you can get an email list building tool, featured product displays, social media icons with the mobile responsive output. You can choose the homepage layout according to your requirements by using the granular settings system. When you purchase any of the products after joining the club of SteadyIncome, you would get more access to more products of the low price. MoneyFlow is a modern and professional blog theme that can be used for affiliate marketing. This theme offers a collection of advanced features with secure monetization facility. This theme is also a product of MyThemeShop that provides a set of layouts to choose from. Plus the clean, user-friendly design and features can help to improve the profitability of your affiliate venture. If you are an affiliate marketer and blogging is your main source of income, MoneyFlow is the perfect way of monetization. It was created for websites with lots of content posted frequently in mind. If you checkout the demo version of the theme, you will get a grasp of the features and functionalities it has to offer. One of the most significant traits of the theme is its integration with WooCommerce that lets you add an entire affiliate shop into your website. You can add customizable email opt-in forms, star ratings for product reviews, and mega menu for enhanced navigation. Moreover, the theme is also SEO friendly that will help you rank your page on the search engine. And the last theme to add to the list is a Genesis child theme. While Genesis is great on it’s own, it only gets better with a child theme. And what better for an affiliate marketer, than a theme designed by a fellow marketer? Smart Passive Income Pro was created and designed by Pat Flynn – affiliate marketer extraordinaire. This bundle includes the Genesis framework along with Pat’s own custom designed child theme to help you create a better affiliate marketing website. A bold design and create content areas make it a great start for your blog or marketing site. Upload you custom logo, select striking brand colors to stand out, and even add a WooCommerce store. Affiliate marketing is one of the prominent ways to earn money online. But if you want to be a successful affiliate marketer, you need to use the right tools in the right place. A high-quality WordPress theme is one of the fundamental tools for having a quality affiliate website. These 10+ most efficient themes mentioned above can be a great option to start your affiliate journey at large. There are lots of affiliate themes in the marketplace and the options can be confusing. This article aims to provide you with a solid idea to choose the right theme for your next affiliate project. So pick the best-suited affiliate marketing WordPress theme for your purpose. Then put your marketing plans into action as soon as possible. I hope this article helped you much to choose the right theme for your website. If you use any theme that suits with the affiliate marketing that I have missed in the list, let us know in the comment section below! WooCommerce makes online retailers’ lives easier. Integrating with your WordPress site, WooCommerce lets you create your own online store with WordPress and customize it according to your liking. Given this fact, it’s not surprising that this open-source e-commerce WordPress plugin backs more than 20% of online stores. Impressive, right? However, even though creating a fully-functional WordPress store has never been simpler, getting it noticed by the right customers may be challenging. This is where social networks step in. Today we’re going to look at ways to refine your social media marketing tactics to engage customers, generate qualified leads, and increase WooCommerce sales. Social media marketing is not just about increasing your exposure. It also helps you connect with your audience on a personal level, build trust with them, and position yourself as a highly relevant online resource. Precisely because of that, content marketing should be an invaluable aspect of your social media campaign. To boost people’s engagement with your content, you need to make it relevant to them. Use tools like BuzzSumo to find the most shared topics related to your niche and create original, insightful, and highly interactive posts around them. For example, according to Neil Patel 2500-word articles get more shares on Facebook than their shorter alternatives. The same goes for videos. Typically 4 minutes plus are viewed and shared more than brief ones. People love video content. The fact that 1 billion hours of video are watched every day backs me up on that. And, live videos are even more exciting, because they feel more natural. This is a great opportunity to engage your customers and generate more sales. All major platforms like YouTube, Facebook, or Instagram support this form of content. We’ve talked abut Instagram for e-commerce before on the WPExplorer blog. But the rise of Instagram stories (which is now as twice as big as Snapchat) means there’s no better time than now to give Instagram another chance. Moreover, they play a major role in generating leads and boosting conversions. Stats say that at least 20% of Instagram stories result in direct messages from viewers. To harness their power, you can use them to engage your potential customers with brief polls or ephemeral photos and videos. The ecommerce world has become overly competitive and, to survive, you need to keep improving your marketing practices. This applies to all segments of your strategy, including social media marketing. Most customers who have a question or complaint expect to see your answer in an hour. Still, many businesses don’t take customer feedback seriously and leave their questions unanswered. This is a huge mistake, given that 88% of these customers will decide not to buy from you. To boost user experience, consider implementing a live chat plugin to provide answers to their questions 24/7. You should also take advantage of social mention monitoring tools, as they let you track both your direct and indirect brand mentions across different social media platforms. This way, you will be able to give your customers valuable answers and help them complete the purchase in real-time. Your followers expect you to share posts consistently. Of course, this can be extremely challenging and time-consuming when done manually. This is where social media management tools step in, as they allow you to manage your posts ahead of time and then publish them automatically. You might want to consider Blog2Social, SNAP or Social Snap. There are numerous social media plugins and WooCommerce extensions you could consider installing. Here are a few helpful ones to checkout. StoreYa brings your WooCommerce store to Facebook. Just install the plugin, connect to your Facebook and automatically import your store. With it customers can find create “want” lists, win coupons, look for group deals, and so forth. You can also offer “scratch & win” promotions to boost sales. This handy plugin can even be used to add your Twitter posts, Pinterest boards and Youtube channel into tabs to your page. WooCommerce Instagram Gallery integrates your store with your Instagram account. The beautiful photos of your products you post on Instagram with a branded hashtag will appear directly on your WooCommerce store product pages. Setup takes a couple minutes – just connect to Instagram and add hashtags to the product(s) you want to display your feed on. This makes it even easier for customers to share your products on social media. The WooCommerce Wishlist lets your customers create their own wishlists on your store and then share them with their followers on Facebook, Twitter, or Pinterest. Wishlists are helpful in driving sales from return customers. But shareable wishlists can introduce your store to a whole new customer base. Users can create lists to share with friends and family for birthdays, weddings, baby showers and more. Social Coupon for WordPress may increase both your social media presence and sales. It works on a simple principle – customer likes or shares your product page in exchange for a discount on their purchase. Use the plugin to add social coupons to your product pages, car and checkout. Once a customer completes a social action the coupon code is automatically applied to their cart. Content marketing tactics mentioned above are great as they bring value to your customers and inspire them to visit your site for more tips and information. Once you increase brand awareness and engage visitors, you need to inspire them to make a purchase. Now, using social networks to sell is a powerful tactic, but it depends on your target customers and the platforms you use. However, there is one mistake almost all online retail businesses make – trying to make a sale right off the bat. Remember that your customers want first to learn more about you and buy from you when they’re ready. The social media landscape has become overcrowded. Your customers’ news feeds are filled to the brim with various branded posts, making it difficult for you to get yourself noticed. This is where paid advertising shines. Its amazing targeting options will boost your visibility, let you promote your top content and offers to the right people, and help you drive loads of qualified leads to your site. Google Ads is a great place to start with paid ads. Just like their name says, in-app ads give your customers the opportunity to purchase the desired product without leaving your social media platform. This is especially important for mobile users. On Facebook, for example, a customer can even save their credit card data and make their future purchases even simpler. And with the help of a Facebook remarketing you can target folks who have visited your store before. Today’s users don’t trust branded content anymore. They want to learn more about your brand from other customers’, real-life experiences. And, one of the most effective ways to give them the information they’re looking for is to leverage user-generated content (or UGC). To encourage people to share UGC and use your branded hashtag, you should consider rewarding them. For example, advertise a discount for leaving a product review (there’s even an easy Review for Discount plugin you can install to add this feature). Or organize a giveaway on social media. To enter the competition, a user needs to share a photo of your product. Just be sure you’re following all applicable FTC guidelines and local laws. Influencer marketing is the fastest growing online customer acquisition tactic. It builds trust with your customers and makes your products more credible. Seeing that popular people in your niche use your products, your potential customers will want to use them, too. You just need to make sure you choose the influencer in the same industry and offer them something worth their attention. Social media marketing is the missing part of your WooCommerce marketing puzzle. It gives you the opportunity to engage your customers, build trust with them, and guide them down your sales funnel towards making a purchase. How do you use social networks to increase WooCommerce sales? Do you have any social media marketing techniques for WooCommerce stores that you’d like to share? Your favorite WordPress marketing plugin got another upgrade! Hustle’s new Gutenberg and reCAPTCHA integrations make it easier and less spammy to grab new users with pop-ups. Want to make a special offer, get more social followers, or grow your mailing list? Hustle handles all the technical-backend-code-jiberish so you can publish stunning campaigns quickly. Hustle adds a powerful customizer, slick animations, display conditions for audience targeting, and hundreds of integrations (thanks Zapier). If you’re not here for the upgrade report and can’t wait to get started, join nearly 100,000 Hustlers. But how much is it? Free on WordPress.org! Or get Hustle Pro as part of your WPMU DEV membership, free for 30-days. Project Gutenberg is officially in the wild and WordPress has a new block editor. So what does that have to do with Hustle? Hustle now has his own block making it quicker and cleaner to add your pop-ups, slide-ins, embeds, and social bars into your posts and pages. No more copying and pasting shortcodes. No more code snippets mixed in with your content. Hazzah! If you’re already using Forminator’s block, you’re going to love the Hustle integration. Hustle now has his own Gutenberg block. Look how easy it is. Scroll down to Hustle Blocks and select the opt-in that you want to display. Done. Not a fan of the new editor? Hustle has classic support and will continue to work until you’re ready to make the change. You want to grow your mailing list but you sure don’t want your list stuffed with a bunch of bot subscribers. It’s a big waste of time and costs money to send all those additional emails with no return. In steps Hustle’s reCAPTHA tool! Now you can add reCAPTCHA to any form. It’s free, quick, and easy. Get your free security keys and plug them in on the Hustle settings tab. Put reCAPTCHA in your pop-ups to stop spammy bot subscribers. Add a reCAPTCHA field and watch those bot subscribers disappear. Get your Hustle on with added security, spam, and abuse protection. Hustle comes packed with a lot of sweet tools and integrations, and we’re committed to improving and increasing functionality. Hustle 3.0.7 has more than a dozen upgrades and bug fixes, including improved compatibility with Visual Composer, a new hours option for display conditions, a developer API upgrade, and better support for Mailchimp and ActiveCampaign users. Use Hustle on your next project for free. Or unlock Hustle Pro and get access to all the WPMU DEV site optimization tools, forms, marketing, and support free for 30-days. If you don’t absolutely love it, you can cancel and keep Hustle Pro. During the 2018 State of the Word address, Matt Mullenweg acknowledged lessons learned in the process of releasing WordPress 5.0. One of those was the need for various teams across the project to work together better. The friction during the 5.0 development cycle was beneficial in that it surfaced areas where the project can grow and sparked conversations that are already leading to improvements. Last week Mullenweg announced that WordPress is expanding its leadership team to include Josepha Haden in a new Executive Director role and Joost de Valk as the Marketing and Communications Lead. These new roles better distribute project leadership to more individuals who have demonstrated the ability and judiciousness to guide large, diverse teams towards success. Haden will be overseeing WordPress’ contributor teams and de Valk is leading the marketing team and overseeing improvements to WordPress’ websites and other outlets. Responses from contributors have so far revolved around a similar theme – the desire for more clearly-defined projects and goals for teams, along with more communication from leadership. Meagen Voss offered some valuable insight from a newer contributor’s perspective. She said the leadership of the project is very unclear and that people could benefit from that information being more prominently published. She also suggested that WordPress explore the idea of having ambassadors for each team to facilitate communication and collaboration across projects. You get to know your team very well, but no so much other teams. I’ve met some great folks in Slack and am getting to know the two groups I’m involved in super well. But if I have an issue or a question that needs to be addressed to another group, then I would have to hang out in that team’s channel for a while to figure out who the right person is to get in touch with. Identifying “ambassadors” or points of contact for each group could be a quick and helpful way to address that. The conversation is still open for contributors to jump in and share their own challenges and suggestions. Haden plans to follow up with the next steps after gathering more feedback. Action born out of these conversations has the potential to greatly improve contributors’ experiences working together, resulting in fewer people burning out on communication struggles or losing momentum from lack of clearly defined objectives. Everyone knows that in today’s globalized world nothing is as crucial to commercial and business success as a good and effective marketing strategy. From young boys hawking the latest newspapers and pamphlets advertised through their gruesome crime reporting or incredible tall tales to the late century posters and flyers handed over soapboxes to workers and laborers to stir them into action over political causes, marketing has consistently made a difference between winners and those histories that are forgotten. Marketing is all about knowledge. Knowing your audience, you’ll know what is important to them, what they will respond to and what their concerns are—and how you can service them. Knowing your product, you are keenly conscious of how to turn any weakness into yet another strength. Finally, knowing how to express yourself, is perhaps the most important part of marketing. And after all’s been said and done, the single most relevant place to express yourself—and to engage in any marketing—is the internet. How you show yourself online is your actual calling card to the vast majority of this planet. Knowing which WordPress themes are most effective for the purpose of creating marketing related websites—that, has been done for you, in the form of the following collection. Jevelin is a powerful and professional quality, robust and reliable, modern and sophisticated, highly responsive WordPress premium multipurpose website theme. This theme is the ideal solution for webmasters in need of a quick and easy way to establish an online home for their projects and endeavors of any nature, from personal to professional, commercial or corporate, with utter ease and speed. Jevelin packs full-featured demo websites for you to get started off on the right foot across multiple niche markets, while tons of page templates expand what you can do with your website while looking polished and professional. It’s extremely intuitive page builder plugin, combined with the eloquent Slider Revolution premium plugin, furnish you with tools to competently polish your pages and websites to suit your most precise graphical specs and branding requirements. Jevelin is perfect for businesses that require complex functionality and plentiful customization capabilities while requiring no coding knowledge; with its WooCommerce-powered commercial capabilities including multiple payment processing, shopping carts and product catalogues with customizable, endless fields, handsome showcase custom settings and much more under the hood allow businesses to effortlessly market their products or services to their massive online audiences, bolstered by extensive SEO friendliness. Try Jevelin today! Marketing Pro is a crafty and responsive WordPress creative multipurpose website theme. This theme is a flexible framework for articulating powerful digital marketing websites. Filled with possibilities for increasing your performance, Marketing Pro elevates your business. Intuitive to a fault, 9 ready-made templates let you hit the ground running overnight. The integrated Visual Composer provides you with an easy way to style your website. Customize your layouts and settings with utter ease and speed. Tons of convenient commercial widgets are at your disposal. Expand the functionality of your pages within a few clicks. The Convert Plug Popup lets you create massive email lists in no time. It also integrates with several of your templates in a very handsome presentation. Marketing Pro lets you reach users wherever they may be with complete cross-compatibility. Mobile and desktop devices and platforms will see your content flawlessly every time. The Bootstrap framework powers all of Marketing Pro’s responsive features and adaptive image technologies. Advanced theme options let you quickly brand and style your pages to suit your business. You can market your products or services with powerful commercial capabilities powered by WooCommerce. Digital marketing has never been this easy! Check out Marketing Pro today! Divi is an incredibly versatile, amazingly pliable, unfathomably strong and impressively aesthetic WordPress responsive multipurpose theme, designed with the sheer power and thorough adaptability to seamlessly adopt any shape and function required by a multitude of imaginable needs and purposes, from personal blogs to business websites, from corporate pages to freelancer portfolios, Divi can do it all. It’s peculiarly well-suited for the purposes of a website focused on marketing related activities, marketing related business or simply for online marketing hubs—if you’re in the online marketing game, Divi can do wonders for you. Not only is the incredibly powerful Divi Builder going to let you create the most unique, incredible layouts within seconds with an intuitive, stack-based interface that is loaded with dozens of different, fully functional modules to build your pages with, such as Shops, Social Media Follow buttons, pricing tables, countdown timers for your promotions and offers, testimonial sections at the drag of a block, call to action, audio player… A lot may claim to do it all, but Divi actually follows through. This full-fledged, responsive, expansive theme is boosted with SEO friendly code to top the ranks of the search engines in no time, and take your marketing website to the next level! If you are an agency or even a freelancer, Bridge is the marketing WordPress theme you should not miss. Here it is, ready and set to take your services and talents to a whole new level. Be it that you offer exclusively SEO services, email marketing, social media advertising, media buying, you name it, with Bridge, you can create a website for all of them. Of course, if you are a marketing agency offering a complete pack, again, Bridge is here to treat you well. Bridge comes with relevant demos which you can employ with ease. There is no actual requirement for any prior knowledge since the amazing drag and drop feature allows you to be creative even if you are not a coder nor a designer. That said, you do not need to touch a single string of code and still come up with an enviable marketing page. Stash is a powerful multi-concept WordPress theme. Featuring a Visual Composer, you can build your website within minutes! Boost your productivity with an awesome tool that’s adaptive to all environments. It offers a beautiful look on the layout department. Get 16 inner pages, 7 portfolios, a child theme and advanced panel options, with tons of demo and homepage options to choose from! Backgrounds, fonts, layout and headers can be tailored with your distinctive touch. Colors schemes are unlimited and customizable. General design is Retina-ready, cross-browser compatible and fast. A theme built for easy access and great customer experience! Stash is SEO-optimized to help you have a better scoring from any browser. The selling aspects are handled by WooCommerce, while text translation is handled by WPML. Try its amazing Mega Menu with dropdown style, perfect for marketing and all market-related businesses! It’s ready to display all publicity elements both for sellers and clients. Available within a click away! There is not much to ponder on here; just get Stash! Professionalism is a quality that all corporate websites must have. Uncode is a WordPress theme that can improve your corporate page, helping you to impress potential customers. This is a versatile and user-friendly product, given that it can adapt to any business niche. With Uncode, there is no limit to what you can achieve. Every customer will benefit from an astounding collection of site features. You can also enjoy some premium WordPress plugins, which were added free of charge: Visual Composer, Slider Revolution, Layer Slider and iLightbox. In total, you will save up to $86. Thanks to the modern media library, your corporate site can host an expansive marketing campaign. Content from Flickr, YouTube, Vimeo, and Twitter can be easily featured. For those with a preference for online commerce, the popular WooCommerce plugin was added. You will be able to create a successful online store that facilitates the distribution of merchandise. Uncode has many customization settings, as each client can design a corporate page that matches his vision. It is possible to change the page typography, given the inclusion of Typekit, Google Fonts, Fontdeck, and so on. A social sharing function is available, along with some useful Google Maps and crisp CSS3 animations. LeadEngine is an engaging, dynamic and responsive WordPress multipurpose website theme. This theme empowers users of all backgrounds to create polished, professional websites. Marketing agencies are a natural fit for LeadEngine. With a curated Marketing demo, LeadEngine sets you up in one click. Customize your marketing website as desired with the effortless WPBakery Page Builder. Brand it to match your business in a few clicks, through custom settings panel. Deploy over 200 shortcodes including graphs, charts, lists, multimedia and more. Tell your customers what your marketing services will do for their business. Dazzle your visitors with seamless animations and visual effects. Present your marketing portfolio in a clean, minimal framework, and make an impression. Create unique pricing plans and options for your clients. Make the sale, with seamless handling of payment gateways. LeadEngine is all you need to make it big in marketing! SEO Engine is a tech oriented WordPress theme. It features 12 homepages for different purposes. You can also find several portfolio, team and case studies pages in this theme. SEO Engine uses the amazing Redux framework to make admin panel the most flexible. It uses Drag & Drop Visual Composer as page builder and a live customizer. For layout you will find unlimited color mixing, dynamic page headers, and even a child theme. SEO Engine is available with one-click installation for all its demos. The developers made this theme fast and responsive since they optimized it for SEO. For posts you will get many typography and iconography options. You get to use Google Web Fonts and Font Awesome icons too. SEO Engine is WPML and Contact Form 7 compatible as well. This theme is ideal for software developing companies and online digital market agencies. It has a practical, modern, minimalistic and clean concept. You will get it with shops to set up thanks to WooCommerce plugin integration. Get it with an awesome admin panel right on purchase! SEO Engine provides the best support on 3 different ways. Get documentation, constant free updates, and custom support team! Get completely tuned up with a greatly built theme! Use SEO Engine! Intact is a multipurpose WordPress theme. It is an award winner on demos and provides +10 of them pre-built. It gives you a child theme and one-click installs. Within demo selections you have Intact Marketing Agency for specialized features. This theme gives you a Redux framework, Lightbox gallery and Revolution Slider. You will have a premium quality page builder such as Visual Composer. Layout is responsive and has perfect pre-built choices to get a quick set-up. This gives your design modern looking and clean concept. Intact Marketing Agency adds special treats like pie charts and progress bars plug-ins. Updates are constantly on the way to get bug fixes done. Intact makes impact with smooth customizable backgrounds and +600 Google Fonts. Find amazing headers and footers as well as portfolio styles pages to customize. Intact Marketing Agency specializes in 3 main areas. These are marketing communications, paid media, content marketing. Get the help you need from all documentation and tutorials available! Analyze ratings and get news alerts options. You can month reports, graphics of your performance and much more. Like any agency that sales, WooCommerce compatibility is there to help you. Intact is also WPML compatible. Give your agency a whole new status with Intact Marketing Agency! Studio 9 is a multipurpose WordPress theme great for marketing and landing pages. The practical but flexible set up makes it ideal for all kinds of publicity and product display. Set up shops with WooCommerce integration and feature tons of products with galleries. Studio 9 has an intuitive panel enhanced with shortcodes to make it user friendly. Building will be quick and painless. There are 3 versions available according to objective and budget. You get the standard, the developer, or the club member version. Studio 9 is responsive, fast loading and translation ready. You can adapt this theme to screens and devices, and the developers optimized it for speed. You will get it with a clean code and lots of advanced options for the theme. Studio 9 has a versatile layout with many features. They also featured unlimited colors, 3 columns, and several widget areas. You will also find visual grids and lots of spaces to set up portfolios of different kinds. Studio 9 has a professional touch that makes it ideal for online companies looking to get an edge. Use its documentation and child theme too. Try it right now and let its power convince you! Try Studio 9! Upshot is a reliable and responsive WordPress multiconcept, multipurpose business website theme. It’s an elegant framework for articulating purposeful websites. With Upshot, building enticing, attractive navigational experiences is easier than ever before. A curated collection of powerful templates let you start things off on the right foot every time. Upshot is ideal for a broad range of applications across all sorts of industries. Lightweight and fast-loading, Upshot is an efficient performer and will keep server-loads down. With a responsive nature, Upshot renders beautifully across all platforms and devices. No theme is more cross-compatible than Upshot, broadening your audience. Uplift is a clever and concise, modern and massive, lightweight and lightning-fast, readily responsive WordPress business and corporate multipurpose website theme. This theme is a professionally developed, enormously ambitious and highly intuitive one-stop-shop solution for webmasters from any background to easily and effectively put together modern, appealing, engaging websites across all sorts of businesses and industries. Uplift has a particularly apt profile for servicing all sorts of marketing websites, from marketing to affiliates and everything in between. It’s out of the box compatible and visually integrated with the WooCommerce commercial plugin suite, making Uplift websites natively capable of marketing your wares to a massive, undifferentiated online audience without skipping a beat. A painless, 5-star-rated Demo Importer allows you to replicate any of the included demo websites instantly for easy customization through the Swift Page Builder plugin, also included. A powerful, top-down SEO enhancement is present throughout all of Uplift’s codebase, ensuring that your marketing is as effective as possible by allowing you to make a real dent on search engine rankings, netting you more and better quality traffic. And with top-notch ratings on Y-Slow and PageSpeed, you can rest assured that your marketing will load quickly and effortlessly the world over. Try Uplift today! Kalium is a sleek and effective, tech-savvy and easy to use, modern and attractive, superbly responsive WordPress creative multipurpose portfolio and online shop website theme. The developers created this theme as an all-around power kit of capable tools and innovative features readily prepared to muscle your demands of all sorts of websites across a variety of industries and fields. Kalium’s utterly free creative environment, its intuitive website design process based on plugins like Visual Composer and LayerSlider, and its e-Commerce capabilities emboldened by nimble integration of the WooCommerce plugin suite, make Kalium a favorite among mobile app developers and marketing campaign webmasters looking for a solid solution for receiving incoming traffic from all kinds of sources. It includes several modern and trendy Landing Page template pages and demo websites that will save you time and effort as you set up your landing page websites for your apps or campaigns, or any other project requiring the handling of large volumes of user traffic while informing users in an eloquent fashion about products, services or works available or offered. Kalium’s supremely mobile friendly Bootstrap based code features some of the fastest and most responsive coding on the market today, running smoothly on platforms and devices the world over. Try Kalium now! Crane is a strong and reliable multipurpose WordPress theme. If marketing is your area, you are in the right place because this is a powerful selling gadget for your arsenal. Its many features will surely help you create an appealing website. Crane is ideal for selling everything everywhere, so it suits like a glove for businesses of all kinds. With this theme, you can market products or services online or promote a physical store. Specifically, you’ll get 11 spectacular home pages and more than 150 complete inner pages. Select between 5 premium clipart images and 2,000 icons to get your visual appeal high. Mega menus are likewise available for creation in wide or normal submenus. Get crafty with headings, custom fonts, fancy text, and price tables. Crane also features Google Maps to locate places, timelines, and extras. Enjoy designing your site’s message box, accordions, or charts for your potential customers. The possibilities are endless! In addition, Crane uses a responsive animation platform and a drag-and-drop slider, the Slider Revolution plugin. You can build your website with Massive Addons for Visual Composer, too. Crane is very easy to install with only one click. It is made to be user-friendly and counts with excellent documentation. If you still have doubts, a five-star support team is ready for you! Launch your business now with Crane! SEO Crawler is a WordPress that specializes in providing refine and premium services. It works on all markets on digital platform that require search engines. You will get it with full documentation and with awesome support. SEO Crawler is compatible with great plugins like Rankie, W3 Total Cache and Yoast SEO. The creators also evidently made it SEO optimized. For design purposes, you get integration with Slider Revolution and iLightBox! Set up awesome multimedia galleries and posts. Additionally, you can set the layout in boxed or full-width mode. SEO Crawler has a live customizer that makes changes immediate and easy to visualize. It counts with dozens of pre-built layout options for portfolios and blogs. You will even find flexible backgrounds and 8 posting formats available. Options to create different services pages are practically unlimited! SEO Crawler features a powerful admin panel and tons of design customizations. Mix and create different looks with unlimited colors and sidebars and custom skins. You can also utilize the available social media sharing featured within the top bar. Moreover, you can use the popular and trustworthy WooCommerce to handle commercial aspects. Furthermore ,you get to set amazing shops with showcasing portfolio pages. Lastly, SEO Crawler is translation ready through RTL, WPML. Come get it with just one-click demo import! Come get SEO Crawler! FatMoon is a gorgeous and lightweight, incredibly smart and technologically savvy, modern and responsive WordPress creative photography multipurpose website theme. This theme is a resourceful and imaginative website building toolkit, a clever and competent framework for the painless and streamlined development of a wide assortment of diverse website archetypes and applications across all industries and fields. Peculiarly adept at handling visual content in an elegant, appealing presentation, FatMoon is perfect for digital marketing campaigns, online marketing websites, affiliate marketing websites and all similar, related enterprises. Its sophisticated image gallery and product portfolio capabilities place it above and beyond other themes on the market today when it comes to making your marketed products look amazing to the general public, while the seamless integration of the fantastic WooCommerce e-Commerce plugin suite makes FatMoon a natural salesman, ready to market your wares to a massive online audience within minutes of initial setup, in a visually cohesive online store page that is both entirely predesigned and deeply customizable for your utmost convenience. With the premium Visual Composer and Slider Revolution plugins, making your layouts and template pages completely your own is fast and easy, while cross-compatibility the world over is taken care of by FatMoon’s Bootstrap roots. Try FatMoon now! TopSEO is a robust and reliable, modern and comprehensive, feature-rich and tech-savvy, readily responsive WordPress SEO and digital marketing website theme. This theme is a perfect platform for the speedy and intuitive design and development of amazingly modern, resourceful websites specializing in making a significant dent in establishing an online presence for your company, your projects or your ventures of any kind at all. TopSEO requires absolutely no coding skills in order to pull off professional quality graphical environments for your audience to explore your content within. Digital marketing agencies love TopSEO because it’s equipped out of the box with every single tool and option you’ll need to get your campaigns to rise to the top of all the relevant searches in no time at all, thanks to an extremely polished SEO engine powering TopSEO’s every element and page from the codebase up. That allows you to sit back, relax, and focus on your content, while TopSEO brings the people to your website in massive volumes, simultaneously going easy on your servers due to its sleek and optimized HTML5 coding, which is both fast-loading and lightweight. Based on Bootstrap, TopSEO is also inherently mobile-friendly and responsive. Check out TopSEO today, and find out! Inbound Marketing is WordPress theme oriented to digital markets and all landing pages. It uses Visual Composer as page builder and has tons of shortcodes to help simplify panel tasks. Inbound Marketing provides several pre-built landing pages and blogs with full browser compatibility. You get to set up unlimited portfolios and blog layouts too. To feature photo galleries, you get to use a premium slider like Slider Revolution. The creators integrated Inbound Marketing with Essential Grid and Contact Form 7. This way you get to make customized posts and reach more potential clients. They built this theme using Bootstrap and you can translate it with WPML. You can change its flexible layout in either boxed or full-width format. Also, you will get unlimited colors and 3 different homepages to choose from. Sidebars to move and display or and even Parallax image/video to set are also available! Moreover, they built Inbound Marketing on a code easy to understand based on LESS and CSS files. This, alongside its documentation and custom support make it simple to manipulate. It is also, beyond all doubt, very responsive and adaptable to screens. Go ahead and give a chance to start your online marketing career with this great tool. Go and get Inbound Marketing! Interactive is an impressively modern, incredibly inventive, visually engaging, dynamic, vibrant and colorful WordPress responsive multipurpose theme, built with the intention of creating a handsome WordPress theme solution for webmasters who wish to create profoundly reactive websites that come alive when gazed, browsed and navigated by your visitors in a myriad, deeply customizable ways meant to envelope and fascinate your audience into becoming regular visitors. Which is exactly why Interactive is a perfect fit as a marketing WordPress theme—it is especially well-suited for the purpose of exposing a massive amount of people to loads and loads of content, wherein maintaining user interest over time is crucial to the success of the website itself. Interactive was born to answer just such a question, and with its amazing, easy to use features and sections that effortlessly add tons of functionality to your pages in no time at all and with absolutely no coding, Interactive is meant to market. It loads faster than any other theme out there, has a gorgeous off-canvas mobile menu that swipes in and out, incredible social media integration features, superb SEO functionality, smoothly animated sliders at the drop of a hat, and much more. Overall, Interactive is just buzzing with business! SteadyIncome is an aesthetically clean, visually minimalist, technologically savvy, visually clutter-free and user-friendly WordPress responsive online blogging and marketing theme, built exclusively with the needs of marketing experts, amateur online marketers, content producers, content aggregators, freelance bloggers wanting to make a buck off their hobbies or a serious paycheck off a dedicated website. It’s uniquely built to trim the fat and pack only the prime beef in terms of looks, functionality and overall power—it is stuffed with tons of features incredibly convenient to online marketing and blogging in general, such as powerful subscription tools, easy to use ad optimization capabilities, an attractive featured products section, and many more useful features that will overall make your life easier as you establish your personal, digital brand and make a name and a reputation for yourself and your website. SteadyIncome is just the pal to have at your side, as you climb through the rankings of the popular search engines with the cleverly coded, search engine optimized framework of SteadyIncome, viralize your campaigns with prominent social media integration icons, advertise your partners with a handsome logos slider, let people sign up for promotions right off your website and watch your subscription rates skyrocket. SteadyIncome—are you serious about this? Genesis is an endlessly powerful, unimaginably flexible, modern and cutting-edge, visually impressive, functionally fluid and extremely intuitive WordPress multipurpose theme, carefully crafted to be a potent, pliable framework on which webmasters across the board in terms of skill and purpose could build incredible professional-looking, sophisticated and interactive websites that are dynamic, polished and beautiful, without ever having to write a line of code, yet without compromising the thorough depth and breadth of the availability of features, functions, widgets and shortcodes available for every possible website necessity. That’s why Genesis is a great online marketing WordPress theme—it is created to be successful, no matter where it is or what it’s doing, and regardless of the nature of your venture, Genesis never fails to deliver your content in style, thanks to its awesome, responsive design. Every bit of Genesis can be modified to suit your purposes, from columns to layouts altogether to colors to behavior to anything else you can think of—if you can see it, you can change it, and if you can’t see it, you can make it happen. Customized menus, headers, sidebars, footers, Parallax sections, backgrounds… Genesis is clearly the start of a good thing for your website. Will you dare take the first step, and let Genesis do the rest? Foundry is a gorgeous WordPress theme for marketing websites. The creators designed this streamlined and well coded theme with a design that is sure to turn some heads. This product can also accommodate a variety of market niches, considering that you can be use it for portfolio, business, or blog pages. Despite Foundry’s popularity, no two customers will ever have similar sites. The theme also incorporates the Visual Composer plugin, along with multiple page builder elements. Basically, you are able to design a marketing page that perfectly matches your vision. You can even target foreign audiences since Foundry is compatible with the WPML multi-lingual plugin. This can be a very smart business decision, as sites with multiple language settings are often more successful than their monolingual counterparts. In total, you can use more than 20 home concepts and you can use more in the future. With just a single click, users can change the color palette of their site. If your schedule does not allow you to spend much time on customization, you can always import demo pages. Furthermore, they are perfectly functional and user-friendly. Lastly, Foundry will never experience resizing errors, as it is compatible with all operating systems, web browsers, and devices. For customers who want to design a quality marketing website, Pitch is an ideal choice. This WordPress theme gives you absolute freedom when it comes to page customization. It has incorporated a sizable roster of useful features, in addition to a solid design that is sure to entice customers. This also product allows for easy personalization, yet it remains user friendly and accessible. Additionally, it does not require any specialized coding knowledge. You can swiftly import your demo content via the one-click demo importer. This feature saves you lots of time if your schedule limits it. Of course, you can customize the pre-designed content at any time. Pitch alsohas the Select Core Plugin with custom post types, and an astounding full screen slider with Parallax capabilities. With this slider, you can showcase your content/products in a very attractive manner. It is also possible to include picture or video slides. The theme select slider has SVG Graphics and SVG Drawing Animations. In addition, there will be a menu entry animation, and a custom font animation. Few themes manage to present such a vibrant and dynamic design. Pitch has incorporated a full screen menu, and a customizable mega menu. Of course, the theme code is well-written, resulting in an excellent browsing experience for all site visitors. Every website has the power to influence, but only the ones who know how the system works would be on top. Be one with the elite through Nanum. This marketing WordPress theme contains ready-to-use web design and easy-to-use tools to help you publish a great website almost instantly. Perfect for any business niche, Nanum focuses both on the creative and functional side of things. Simply drag and drop content to adjust and improve Nanum to your branding needs, no coding required. Also, you can do it all effortlessly and quickly through the spectacular Elementor visual page builder. Earn profit from your creations better with Nanum’s search engine optimization and drive in more business. You can always count on the immediate technical support from friendly staff as well. There should be no excuses anymore, start on the web strong with Nanum and make a difference. Grab your customers’ attention all the time by ensuring that your page comes out high on search results. Make it possible with Pixzlo, a marketing WordPress theme that’s perfect for you. Loved by users worldwide, this theme enables you to create a stunning website without the sweat. It provides you with the tools to make your creations look alive without limitations. Pixzlo also has a built-in drag and drop page builder that will awaken your inner artist and coder simultaneously. Level up your site with features such as blog posts, menus and animations and spice up the experience. The limits are none with Pixzlo so use it to its full potential and come out with interest sparking website that will promote your marketing services. Startit is an exemplary WordPress theme for your marketing web page. It is powerful and versatile, yet it remains very user-friendly and intuitive. Startit boasts a large collection of practical features, and each feature promises to expand your site’s capabilities. In addition, you will be able to control every element. This theme also allows you to start working immediately. It has multiple pre-designed template variations for blogs, enabling the instant publication of posts. Moreover, you can use several gorgeous portfolio layouts available in this theme to impress potential clients or employers. They can easily showcase your most successful business ventures. Successful marketing sites can provide optimal platforms for online commerce. Furthermore, Startit owners will benefit from the prolific WooCommerce plugin, which enables the creation of gorgeous online stores. Even the best pages can sometimes remain unnoticed by customers. In order to avoid that unfortunate circumstance, this theme is also SEO-ready, making it easier for your site to climb search engine rankings. The developers also added more than 600 impressive Google fonts so you can possible alter the typography of each post. Should any issues arise, you can always contact the support team. Their representatives are friendly, polite, and eager to resolve all problems. X is an incredibly ambitious, outrageously bold, functionally polished, visually accomplished, thoroughly customizable, incredibly pliable, modern and appealing WordPress responsive multipurpose, multiconcept theme, an incredible development that is best described as several themes within a theme, thanks to X’s Stacks system. Currently four Stacks are available—Integrity, Renew, Icon and Ethos, and while all of them are amazingly well-designed, smooth and effective, they’re entirely independent from each other. If you’re thinking these are skins, you’re wrong—Stacks have their own skins, templates, and demos. They’re full-fledged themes in spirit, powered by X’s incredibly array of tools, options, features, widgets, shortcodes and overall expansive functionality, so overwhelmingly broad it had to be packed into four themes, though new Stacks are always in development. This is why X is an amazing online marketing theme—the sheer customization capabilities of this unique, powerful theme make it so that every website produced is so inherently distinct from any other before it that building an online brand, presence and identity is almost effortless with X at your side. Lastly, you’ll find a template for any page you need, and a custom element for everything on those pages—if you’re in online marketing and looking for profit, it’s easy, solve for X.
Urip is an exceptionally polished, incredibly well-designed, robust and solid, fluid and functional, highly customizable, modern and easy to use WordPress responsive professional landing page theme, uniquely designed for the purpose of constructing single page landing websites, static landing websites, and all sorts of landing pages for apps, offers, subscription lists, click through pages, businesses, creative websites, startups, and many, many other possible applications. For these reasons, it’s pretty clear that Urip is an immeasurably valuable tool for the design and construction of online marketing websites. Urip is, among other things, completely lacking in any need for you to do any coding. Additionally, the powerful Visual Composer takes care of that for you, and you’ll drag and drop elements and shortcodes into the fray and lay them out like a pro in seconds. The developers also added the Revolution Slider and the premium WP plugin. With this, you can make incredible, animated, smooth sliders for all kinds of purposes. On top of that, Urip is thoroughly WooCommerce integrated out of the box. Try it out—you’ll be marketing your wares directly from your own online storefront within minutes of clicking the single click required to install Urip. Moreover, add native, extensive search engine indexation optimization, and you’ve got yourself a marketing monster, called Urip. Marketing is a consistently impressive, visually accomplished, thoroughly well-designed, technically sophisticated, modern and highly advanced WordPress responsive landing page theme, designed for the generalized benefit of a host of different websites, from business websites to corporate, from personal blogs to freelancer portfolios—if you’re in the business of distributing any kind of content to the widest audience available in an effective, engaging manner that promotes loyalty and high return rates, Marketing is your theme. Which is precisely why it works so superbly, especially well when deployed for online marketing websites. Marketing is a savant when it comes to putting your visitors in the closest possible contact with your contents, products and advertisements—it is an unstoppable force of flexibility, fast-loading responsivity and time-saving convenience, with tons and tons of exceptionally effective layouts that are particularly excellent at playing nice with ad integration platforms and your personal ad positioning. Moreover, the creators made this theme thoroughly and extensively SEO friendly. Furthermore, they made it thoroughly and extensively SEO friendly. Crawler bots will relevantly index every single bit of your website’s content, and you will see the change in your traffic figures in a matter of days. Overall, Marketing is a theme for those who are in it to win it, and playing the long game, but needing short term results. Launchkit is a thoughtfully thorough, extraordinarily detail-oriented, visually graceful and elegant, technologically advanced, modern and popular WordPress responsive marketing and landing page theme, built to be a one stop shop solution for the needs of an ample breadth of website needs and requirements, and meant to meet and exceed all their expectations while remaining classy and stylish through the entire time. Whether you’re building a landing page for your app, for your coupon code redemption platform, for your event or project, or simple a click through website for your online marketing business, an extensive, content-filled marketing blog or any other kind of marketing related website, Launchkit is well-equipped to satisfy them all. Launch a whole new product line, offer a brand new service, promote a party or simply direct people to where they need to go, with Launchkit. Extended Page Builder elements also allow for full blog feeds, portfolio feeds and many other features to market your wares easily. Moreover, engage your audience and captivate their eyes with smooth Parallax background image sections. Furthermore, you can edit everything live, with the live preview and the advanced theme customizing options—brand every nook and cranny with your colors, typographies and logos in a matter of seconds. Lastly, your visitors can easily contact you using the available Gravity forms and Contact Form 7 forms, while MailChimp enables hassle-free massive e-mail subscription list management. What are you waiting for? Landy is an entirely powerful, wholly pliable, easy to use, highly customizable, technologically advanced, thoughtful, modern and handsome WordPress responsive marketing and landing page theme, constructed to be an easy and intuitive website solution for webmasters trying to create an online foothold for their mobile applications, desktop applications, click through marketing website solutions, upcoming product launches, featured product descriptions or offers and a million other uses. It’s also extremely user-friendly, and requires absolutely no experience with any form of coding—easily drag and drop sections and blocks into your layouts, crafting whole new pages in a matter of seconds, which you can fill out with tons of convenient, useful shortcodes to help with anything from pricing guides to testimonials and mobile store integration. Also, tons of high resolution icons and imagery are readily available to make your Landy websites look spectacular every time, and its natively responsive design assures a flawless rendering across any device. On top of that, Landy is primordially built to be the ultimate search engine optimized theme—not a word you type will fail to be indexed by search engines, in the most ideal order for your actual content to stand out, rather than random bits of coding. Overall, Landy has figured out everything there is to online marketing—pull up a chair. SEO WP is an extraordinarily efficient, amazingly robust, extremely up-to-date, entirely modern, interactive, engaging and visually minimalist WordPress responsive social media and digital marketing theme, built with the raw power and sheer flexibility to easily and effortlessly transform itself into any number of entirely diverse websites, but especially designed for meeting the expectations of social media content aggregation websites, social media hubs, digital marketing websites and marketing related website operations in general. If you’re in the business of distributing huge amounts of content to an even bigger audience, and are interested in retaining this audience, building a following, viralizing your content in social media, maximizing your exposure online, increasing your market share and traffic levels and of course topping all relevant keyword search ranks across the big search engines, SEO WP is the answer to your marketing prayers—a theme built from scratch to optimize the speed at which your websites load, the ease with which robots crawl through them to find your content and index it for search, the effectiveness with which it retains your users’ attention as they peruse your content, and the incredible rate at which your users will return, with SEO WP in place, you’ve got everything going for you. Avada is a mind-numbingly powerful, indescribably mutable, technologically gifted, visually awe-inspiring, fluid, modern, highly customizable and thoroughly professional WordPress responsive multipurpose theme, constructed with the deliberately vague mission of producing the most incredible websites that current technologies permit to exist, while demanding absolutely no coding skills from webmasters, and offering them a seemingly endless stream of incredible functionality that is sure to enhance the look and reach of their content, the effectiveness of their communication and their traffic levels. That’s why Avada is perfect for digital marketing applications. Moreover, its uniquely polished user navigational interface, its amazing visual page building feature, its gorgeous native sliders, its powerful, gorgeous Parallax smooth scrolling and background effects on pages and sections, Avada lets you make pretty much any form of website with absolutely any layout you’re capable of conjuring in your imagination for truly one of a kind pages that are as unforgettable as they are functional, thanks to Avada’s superbly useful shortcodes and plentiful widgets. Also, WooCommerce compatibility means you can set up your online storefront within minutes of installing Avada through a simple one click process, and open up a new revenue stream for yourself or your business within the day. Coupled with helpful, sensible ad placement options, Avada is the theme you’ve been looking for. BeTheme is an enormously expansive, incredibly well-designed, thorough and cohesive, robustly coded and solidly built, visually engaging and appealing, modern and functional WordPress responsive multipurpose theme, created with the ambitious mission to be a one stop solution to all webmasters across the board. It can thusly handle personal freelance portfolios just as well as it handles corporate blogs, product launching pages, online eCommerce websites, professional firms or anything else you can possibly think of—over 130 different predesigned websites are fully included with BeTheme, and there’s no way you can fail to find what you’re looking for when you combine these entirely diverse website templates with BeTheme’s customized, over 200 shortcodes that expand the visual page builder’s functionalities to unfathomable degrees. Widgetized areas, unique header layouts, WooCommerce compatibility, section-based page building, advanced theme options, tons of custom post types… BeTheme can seemingly do it all. That’s why it’s a standout theme for marketing websites—whether you’re posting a video of your product, describing pricing plans for your services, receiving visitors landing from your app or just clicking through an offer, BeTheme lets you take care of your work in seconds while you rest assured that your webpages look exactly how you want them to and act exactly the way they’re meant to, with BeTheme’s responsive, Bootstrap framework coding. Salient is a naturally outstanding, visually unique, eloquently bold, highly expressive, vibrantly colorful, stimulating, interactive, exciting and modern WordPress responsive multipurpose theme, built to service websites large and small, personal and corporate in an equally talented fashion—Salient is less about the nature of your activities, and more about your desire to stand out from the crowd. The developers built this theme so that you can execute every tool and feature included in your website in a completely unique, recognizable, customizable manner. Salient can also make your website look exactly the way it should be within minutes, thanks to advanced admin panel options and an easy to use visual page builder. These factors make Salient an excellent theme for digital marketing purposes, as its general independence from the nature of its content and its overall exclusive focus on producing memorable, distinct and appealing pages that leave a lasting impression on visitors aligns perfectly with the requirements of a digital marketing operation. Obviously, standing out isn’t all there is to marketing—extensive search engine optimization, fluid responsive BootStrap framework coding, tons of convenient pre-configured pages ideal for any online business or blog, useful custom widgets such as the Nectar Slider, optional AJAX frontend search and page transitions—there’s just nothing like Salient out there. Ronneby is an entirely uncommon, visually unconventional, superbly creative, professional yet personable, modern, flexible, powerful and pliable WordPress responsive multipurpose theme, built to easily and seamlessly service the requirements of a whole bunch of diverse websites, from large online commerce operations to small personal blogs, medium sized fledgling startups, professional firms or freelance portfolios, among a myriad other different applications, all sharing a common thread: high performance. This theme is an extremely polished theme with carefully handcrafted, professionally graphically designed themes that are meant to entice and seduce a high end clientele or target audience that is interested in high end products and services. As such, Ronneby is ideal for the needs of a high performance digital marketing website, specializing in the marketing or sale of high end products or services to an equally high end audience. Ronneby is thus built to very, very high standards of quality, and every aspect of Ronneby has been carefully thought out and tested, from its creative, trendy, hipster style layouts to its modern, Parallax enabled pages and sections, every bit of Ronneby exudes quality. With Ronneby on your side, there isn’t a business you can’t succeed in. Are you ready for an infusion of Ronneby? Unicon is an amazingly well-designed, entirely one of a kind, visually stunning, technologically powerful, thoroughly cogent and graphically cohesive WordPress responsive multipurpose design driven theme, specially crafted with the unique goal of producing a theme directed by design rather than by a series of added functions piled on top of each other. This theme thinks that that is going about things the wrong way—you start with the way a website should look and feel, and then work your way up to how it works behind the scenes. As such, Unicon is intuitive both for webmasters and for users to navigate, has a very strong visual identity, is quite branding friendly and inherently memorable and distinct. These features make it a fantastic marketing website theme, as its host of useful features combine unobtrusively within its many completely innovative, amazingly creative predesigned layouts to make truly iconic webpages that while having plentiful functionalities, are visually tied together as a whole and make hierarchy and navigation a piece of cake for your users, which increases the content they’ll happily devour as well as the time they’ll stick around doing so. All of which turns into more profit for you, over time, whether through direct sales through your own WooCommerce eCommerce online store, or through tastefully placed advertisement spaces, fully compatible with all common ad service providers. Take the plunge today, with Unicon!